Malaysia, like most other South East Asian countries is home to several animated local markets which much be experienced on any trip to the country. These bustling Malaysian markets serve up a smorgasbord of local products and eats, while they offer visitors a chance to get a finger on the pulse. 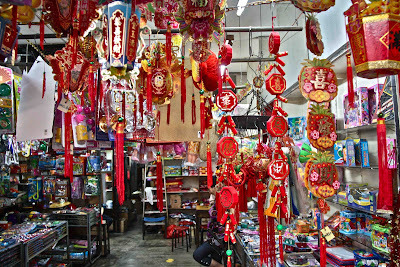 DVDs, apparel, home wares, local crafts, the many busy Malaysian markets offer all this and more. Visitors are also advised that bargaining is an accepted norm at these much -loved places of commerce, so it is prudent not to settle at the first price that you are offered. Another unique aspect of these local markets of Malaysia is that they are not exclusively held during daylight hours and in fact many of these markets (locally known as ‘Pasar Malam’) only open for business at the end of a normal work day. Listed below are some of the popular markets located in major Malaysian cities. Regarded as a landmark attraction in Kuala Lumpur, the Petaling Street Market, located in the midst of the city’s lively Chinatown district is definitely a must-see on any visit. Colloquially known as Chee Cheong Kai (Starch Factory Street), for it once housed a tapioca mill, Petaling Street today hosts vendors who offer a wide assortment of wares, like ‘designer’ sunglasses, shoes, clothes, handbags, watches, accessories, jewelry along with traditional Chinese medicines, CDs and other small electronics and more. Food stalls that sell KL’s renowned hawker fare like Yong Tau Foo, Claypot chicken rice, grilled fish and more form an integral part of the market which also hosts various restaurants like Yook Woo Hin , one of the oldest family- run establishments in KL and the celebrated Restoran Kim Lian Kee. Petaling Street Market is open from 10 am to 6pm every day. For a similar experience at night time, try the Little India night market held on the nearby Jalan Abdul Tunku Raman on Saturday evenings. Located in the vicinity of the Petaling Street Market, is the Bazaar Baru Chow Kit Market which is reputed to be the largest ‘wet’ market in Kuala Lumpur. Largely frequented by locals who head here to do their daily shopping for fruits, vegetables, spices, fish and meat, the market provides visitors a chance to glimpse the everyday life of Malaysians. Chow Kit market also offers visitors a chance to sample various exotic various tropical fruits like rambutans, magosteens, soursop, along with a wide array of cooked foods. Easily accessible via short walk from Petaling Street on Jalan Hang Karturis, is KL’s noted attraction, the Central Market. In operation since 1936, this covered enclave, which once was a ‘wet market’ now, provides a show case for the local arts and craft of Malaysia. The Central market hosts a multitude of boutiques, shops and eateries that offer wares sourced from every region of the country. This daily flea market is the biggest flea market in Penang and operates along Lorong Kulit located near the City Stadium and bus depot for Rapid Penang. This market is often referred to as a ‘thieves market’ as it is populated by vendors who largely trade in second-hand or even some say ‘stolen’ goods. Other markets worth visiting in Penang include the Batu Feringgi night market and Tanjung Banugah market which offers the quintessential ‘wet market’ experience in Penang. Jonker street located in the heart of Melaka was once famous as an ‘antiques’ market. However, today the area is known for its pedestrianized night market which is held on every Friday, Saturday and Sunday evening. The vendors of Jonker Street offer a treasure trove of souvenirs and products, highly coveted by visitors though the market is also known for its many hawker food stalls and shop-house restaurants that offer a good selection of Peranakan(Straits Chinese) eats like ‘popiah’, ‘chicken rice ball’, ‘Assam fish with okra, Otak Otak and many more. The Gaya street market is a market that is held on Sundays, at Gaya Street located in the heart of Kota Kinabalu’s central business district. This area which was originally christened Bond Street, is home to the city’s many family owned businesses, however on Sundays, a section of Gaya Street is shut to traffic as it is taken over by vendors who offer a wide array of goods like batik sarongs, local arts and crafts, ‘antiques’, souvenirs, local foods, herbs and even pets for sale. The Gaya street market is a favorite with tourists and locals alike. The market is open for business from 6am to 1pm.